Thanks to the excellent work of Reiner Geiger, a higher data rate is now possible, up to 24 MHz :-). ❗ Above 4 MHz sampling rate, the timing shown in the OLS viewer seems to be off. E.g. 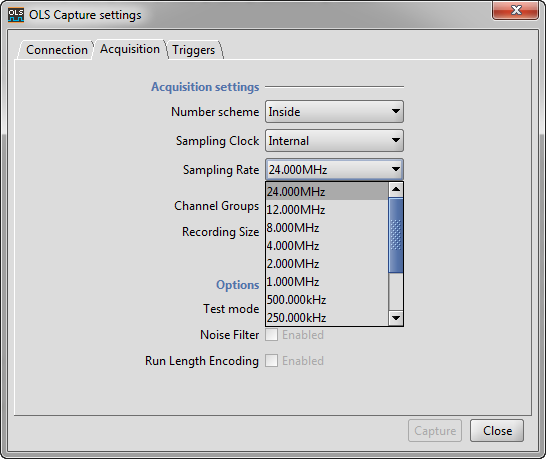 at 4 MHz sampling rate the 1 kHz signal is shown as 2 kHz, 3 kHz at 12 MHz and 6 kHz at 24 MHz. 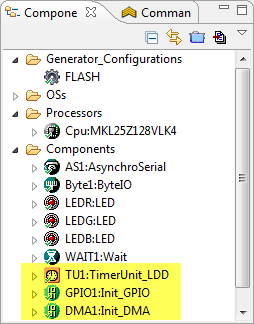 TimerUnit_LDD to generate a clock for DMA up to 24 MHz. 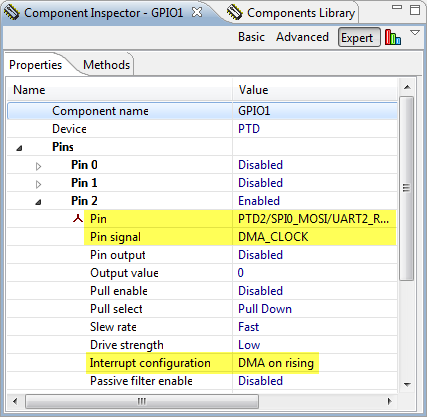 Init_GPIO to configure an input pin to trigger a DMA transfer. 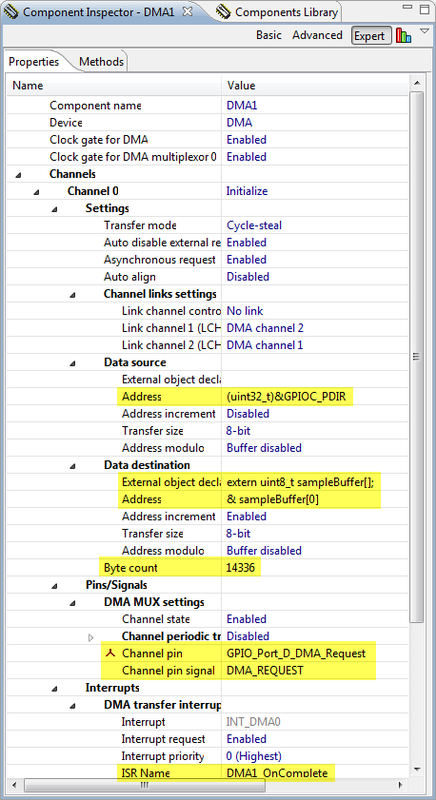 Init_DMA to configure the DMA with channels, data source and pin settings. 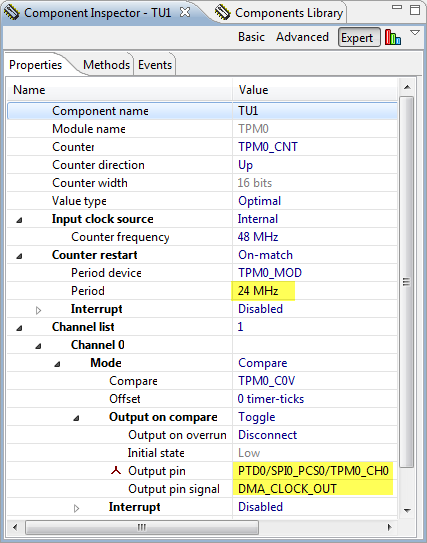 Note: There is a DMATransfer_LDD component available in Processor Expert. According to Reiner this one was not usable, as it was checking if the DMA has been released (which was not possible to disable). So he used the Init_DMA component instead, and saved with this as well 4 KByte of code. The usage of the DMA is pretty self-explanatory in the source file Logic.c. The CodeWarrior project has a new the OLS Logic Sniffer (http://www.lxtreme.nl/ols/) configuration file (ols.profile-FRDM-KL25ZLogicLogger.cfg). Copy that file into the ‘plugins’ folder of the OLS client to update the existing one. 💡 If the updated client file is not recognized: deleting the ‘felix-cache’ subfolder can help. With the usage of DMA, the FRDM-KL25Z logic analyzer is able to do sampling up to a rate of 24 MHz. With this, it is possible to sample even high-speed signals e.g. on an SPI bus :-). I’ll see if I can find the minor timing display problem above 4 MHz,which is not a big deal. In any case, DMA rocks :-). Many thanks to Reiner for his DMA work! The updated project is available on GitHub here. 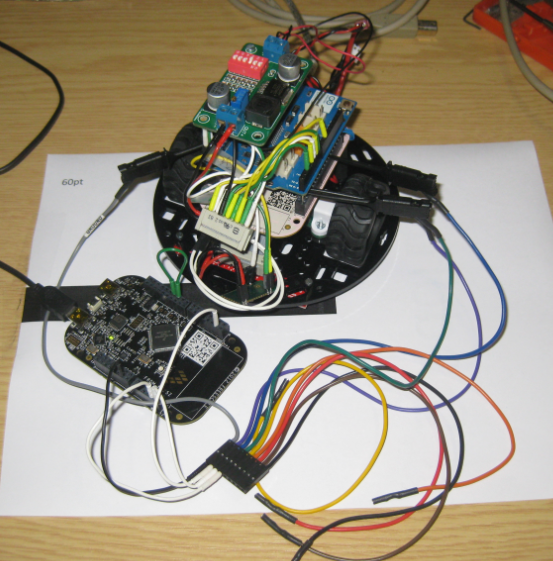 This entry was posted in Boards, Debugging, Embedded, Kinetis, KL25Z Freedom Board, Processor Expert and tagged CodeWarrior, codewarrior project, Debugging, Embedded Component, freedom board, KL25Z Freedom Board, logic analyzer, open source projects, Processor Expert, software, technology by Erich Styger. Bookmark the permalink. I’ve been playing with STM32F3 and F4 Discovery boards (ARM CPU also). The F4 runs at 168 MHz and has 192K of RAM. Would make a great platform for your DMA logic analyzer idea. Hello Bill! 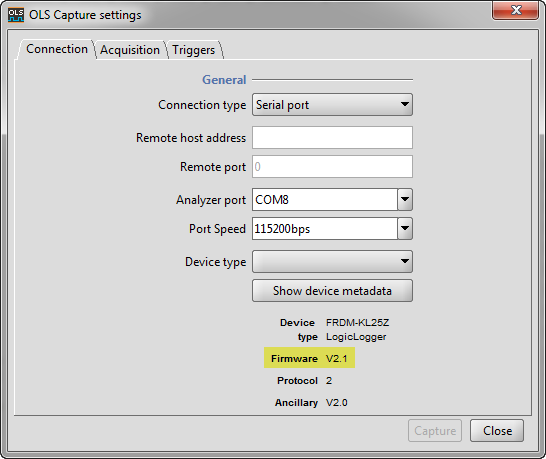 Freescale also have Cortex M4 with 150MHz and DRAM controller, which allows you to have a lot of RAM. But M3/M4 do not have single cycle GPIO, which M0+ have. So difference in this kind of application will be smaller than it seems. I’ve install the newest CodeWarrior 10.4, this version don’t have bean of “ByteIO”, may be I sould change it to GIPO_LDD, I don’t know what the setting of ByteIO for PTC, could you help me? I do have MCU10.4 too, and I have that ByteIO component available and present. So this is supposed to work as is. Did you use my project from GitHub? Logic Sniffer scanned out KL25Z-FRDM board. But when I click capture. It only show the message “Capture from OpenBench LogicSniffer started on…” at the bottom of windows, and nothing displayed. Have you set up some triggers, and they are not firing on the board? Is your application running on the KL25Z? No, I did not set triggers. When I boot up the board, Red Led blink. And when I click on “capture” button, Led changed to Green. Hmm, strange. I’m using FRDM-KL25Z too. Which OLS are you using? I’m using ols-0.9.6.1. I’m using ols-0.9.7 on Windows 7 – 64 bits environment. I have seen a report that there are problems with 0.9.7. Can you try the earlier version? I have Thach Ngo’s similar problem. The differences are WinXP and ols-0.9.6.1. To probe, I added: PTA4(square OUT) – PTC0(IN). But nothing happens. I do not have Windows XP, so I cannot test this set up. 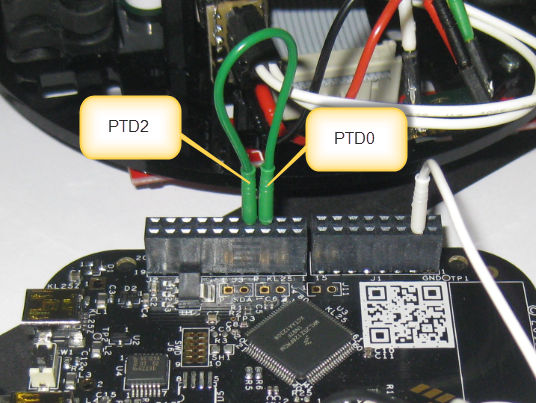 I suggest to debug the application on the FRDM board and to check if things are sent properly. And check if you are able to get a virtual COM port to the OpenSDA properly working, e.g. with writing to the virtual serial port. I repeated with a Windows 8 system. There are not waveform after a capture. OLS shows all channels without signals. I will debug with CW 10.5. Are you using my exact project from GitHub? 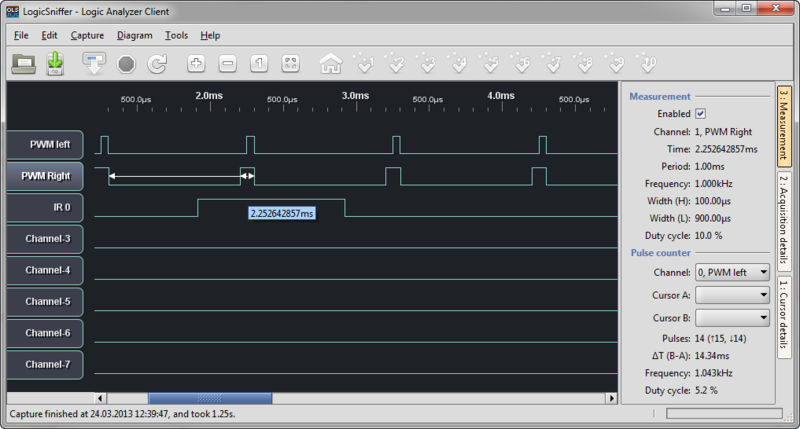 I added a square wave on PTA4(OUT J1-pin10). This is my “signal”. I connected it with PTC0 (J1-pin3). If is correct I must view a square wave on Ch-0. I could see both waves on D0-D2 and PTA4-PTC0 with a DSO and their changes with OLS configurations. Hi Erich, I am trying to build this project. But as experienced by others above, nothing showed up on the client screen. While debugging the project, I recorded DMA_DCR0 register. When clicked “Capture” button, the ERQ bit changes to 1 and when clicked “Stop”, it turns to 0. However, the START bit remain 0 in both cases. But I did have added DMAT1_StartTransfer0() after line 279 in Logic code. The DMA_DAR0 register started with 1FFFF218, but turns to be 1FFFF219. I wonder if this is expected behavior. I am using the exact code from your github. Do you mind helping me debug the project?